Traditionally, the day after Halloween is reserved for putting away costumes, taking down decorations, and bouncing back from a sugar crash. For Cherryland members Dale and Sandy Herman, that day is reserved for work that would put Santa’s elves to shame. For the last 40 years, the Herman’s have spent the month of November setting up one of the most elaborate Christmas light displays in the Grand Traverse region. 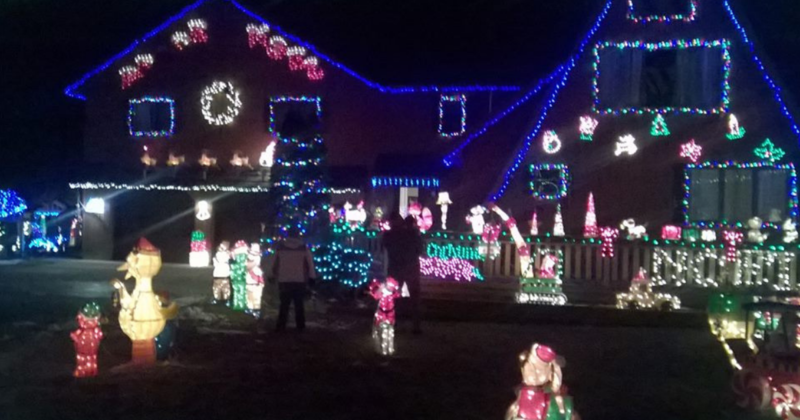 To date, they estimate that they own and display 600 different holiday-themed light features on their Suttons Bay property. From snowmen to Santa Clauses to Nativity sets, the Herman’s began acquiring features from stores, garage sales, online, and even friendly passers-by. They now own enough that it literally fills their garage floor to ceiling. “This time of year, my job, twice a week, is to check the stores for new features,” chuckled Herman. The Herman’s estimate that it takes approximately 240 hours to set up the Christmas display. And they do it under a tight deadline. “Our goal is the Sunday after Thanksgiving our family will gather to watch us turn the lights on,” said Herman. Through the holidays, the Herman’s welcome visitors from all over the region (and the world!) to stroll through their Winter Wonderland. Many evenings they draw a crowd. Between the time and resources it takes to buy, install, repair, and run the light features, the Herman’s light display is not an easy (or cheap) undertaking. But that hasn’t stopped them and there are no plans to in the future. The Herman’s welcome you visit their Christmas light display this holiday season! They can be found at 10780 E. Murray Ct. in Suttons Bay.